The good, the bad, and the ugly - Stop staring and start sewing! I'm scrambling to finish my Sew Simple article and it's going well but I wanted to stop and post about a few things going on. The first ("the good") is just a little icebreaker, plus I didn't want to make a "pictureless" post. The others ("the bad, and the ugly") are on the more serious side. First the good! 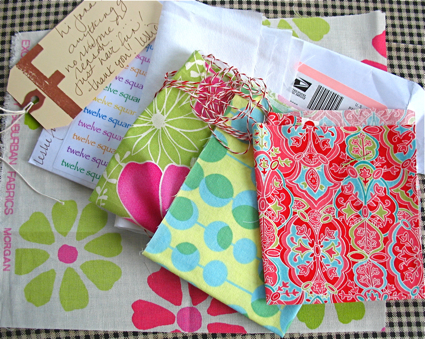 I got another little package this this week from a member of our little virtual quilting bee. These adorable fabrics are from Leslie from a friend to knit with. She says "anything goes!". It should be fun! Now for the bad. I just found out Westminster Fabrics (which includes Free Spirit and Rowan) has raised their prices and if that didn't sting already, as of February 1st they are requiring all of their retailers to list their fabric at the full suggested retail price (putting it at 9.50 yd). I know. Ouch. It's around 25.00 yd in Europe so it could be worse, right (I know, lame attempt at perspective). Now, as a retailer I have to admit it has been very disheartening to try to make money but have a good price (I have had a list price of 8.20 yd this past year) and then see the same products listed on etsy for 6.75 yd. But I'm not sure how helpful this response is given the current economy. Westminster is also requiring that retailers keep their fabrics at the full retail price for a whole year before discounting it (this will probably make it "riskier" to order a full line if there's a good chance some won't sell and we can't mark them down to move them out). Retailers who fail to uphold these new rules risk losing the privilege of ordering from Westminster for a whole year. Now I don't think this stops retailers like myself from having sales (maybe there will be a lot more sales?!) or bulk order discounts but I'm going to have to do some research before I know the full implications of these changes. There is a very good post about it at True up that I suggest you read if you want more information (and a better explanation than the one I just gave). On the plus side, remember that Westminster makes a beautiful product (and I have found all the people I've dealt with there to be very helpful and nice) and I'm sure they will continue to do so. And I will do whatever I can to continue to bring great products to you at the best price I can! Now for the ugly. I don't know if you've heard about CPSIA (Consumer Product Safety Improvement Act) but if you are a home crafter (of any kind) who makes money selling your creations, this new law will affect you! Rather than try to post on this I'm going to provide you with links that explain it so much better than I ever could. It's basically an extreme over-reaction to the Chinese lead laden toys we were inundated with last year. Please be informed! Patty Young has a great post here. Happy Panda spells it out in dollars and cents here. Sign a petition to get it on the new presidents desk this month. Sorry to be the bearer of not so great news but there are still so many great things going on in the wonderful world of quilting and sewing this year that I think we'll manage to work through it all!! Keep on sewing!! (I'll send out updates when I receive them so please be sure to join my mailing list at the bottom of the sidebar or the bottom of Fabritopia's homepage).